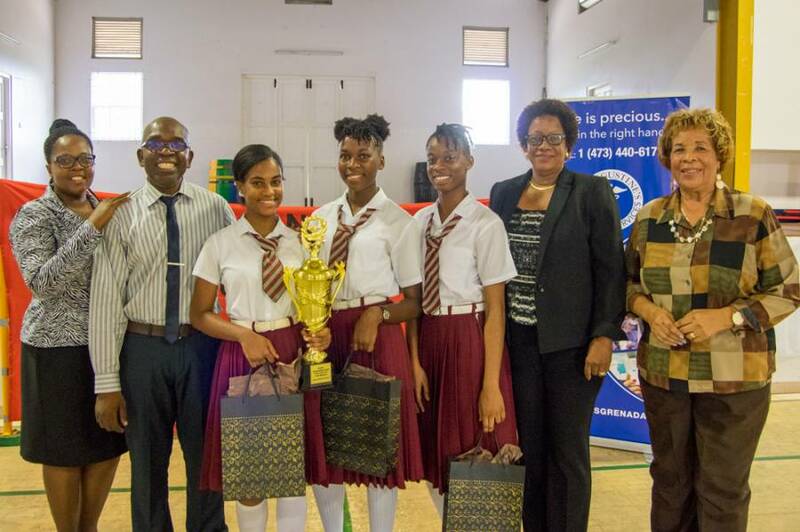 “The wealth of a nation lies in its health”, was one of the resounding take-home messages from the finals of the 2018, National Schools Nutrition Quiz held annually by the Grenada Food and Nutrition Council (GFNC). Lydia Browne, Executive Secretary of GFNC, set the tone for the event with the underlying message that nutrition should play a major part in all lives, with most benefit coming from commencing such practices from as young as possible. The knowledge accumulated by the secondary school students in preparation for the annual quiz, not only helps them to compete but also contributes towards the subject matter appearing in their exams and the opportunity to share what they have learned with the wider population. Present at the event to commend the participating students was Minister of Agriculture Hon. Yolande Bain-Horsford. She noted that the involvement of fourteen schools translated into a total of 56 students, who would be directly impacted, in terms of improved nutritional health and positive lifestyles, by what they had learned in the preparatory process. She concluded her remarks by stating “raising awareness and interest in nutrition will have a significant effect on the population of Grenada. The fact that the quiz is geared at young adults is key, as they are our future.” She continued by praising the hard work and efforts of both teachers and the staff of the GNFC and stating education is the key to healthy lifestyles. In her closing remarks the minister strongly encouraged all to make a concerted effort to strengthen and support the agriculture sector by utilising locally produced foods. At the same time, she highlighted that healthy food need not only be available, but also affordable for the general population. In bringing the finals to their close it was fitting that Finley Jeffrey, Permanent Secretary for the Ministry of Education, shared his great pleasure at the growth and direction of the quiz, a direct result of the collaborative efforts of GFNC and the Ministry of Education. He shared with all the importance of its wider message in light of the unhappy reality of incidences of children, even at pre-primary school age, experiencing dental and health problems, including diabetes and hypertension, due to poor diet. He concluded by encouraging parents to “Leave the processed food on the shelves – don’t put foods in the lunch box which make children sick.” And to students, “Don’t let what has been learnt die with the quiz; lead by example. A Healthy Nation is a Wealthy Nation. Eat something local for dinner!” he concluded. The winner of the National Schools Nutrition Quiz 2018 quiz was McDonald College; represented by Christell Andall, Charisann Penny, Heidi Stanisclaus & Lyandra Narayan.